Markham's Behavioral Health: My Son’s Tutor Slipped Me Entrance-Exam Questions. Should I Report Him? My Son’s Tutor Slipped Me Entrance-Exam Questions. Should I Report Him? 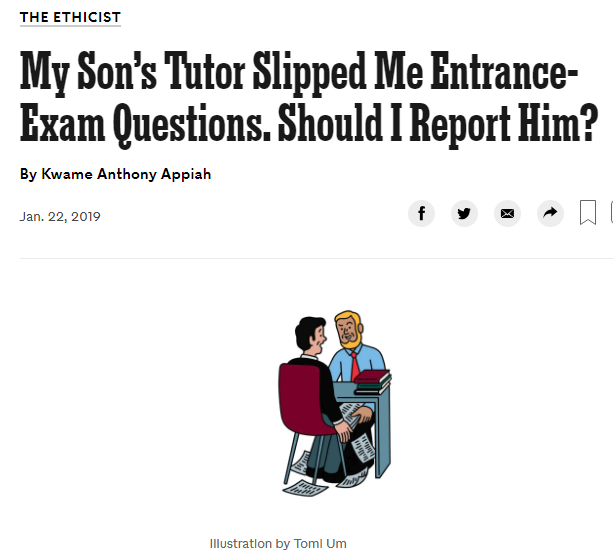 "With some ambivalence, I took him to a well-regarded (and expensive) tutor to help him prepare for the Specialized High School Admission Test. After his session, the tutor asked if my son was also taking the entrance test for a different coveted public high school in the city. When I said yes, he gave me a handwritten paper, explaining that it was a copy of most of the test questions, which he got from “spies” he sent to take the exam. He asked me not to tell others about it. I was shocked and horrified and left with the test. I did not look at it or allow my son to, as I would consider it cheating. Upon arriving home, I put it in an envelope to send to the school’s admissions office, because I believe that it should know its test is available in this way. You can read the Times' answer by clicking here. I would add my own questions and concerns which are related to teaching our children and other people we interact with integrity. It seems that cheating and lying have been increasingly endemic in our society with the current Presidential administration. The corruption is rampant, explicit, and norm changing. As Tracy Chapman sings in her great song "All that you have is your soul", "My mama done told me; she say she learn the hard way; don't give your soul away; all that you have is your soul." What this tutor has done beyond encouraging his student to cheat is to corrupt the system and attempt to ingratiate himself with the parent who is paying his fees. This has far reaching consequences far beyond the immediate participants. The tutor's behavior in providing test answers illictly is toxic for our society, not just for the individuals involved. The larger question about this behavior is what kind of society do we want to create? How can that society embody integrity and mutual respect? With 86% of college students admitting that they have cheated in school, many questons arise about the integrity of our educational system.